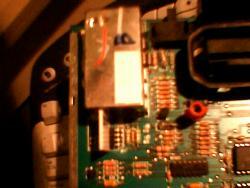 While I had my new 7800 on the bench, I decided to modify it for composite video and audio. 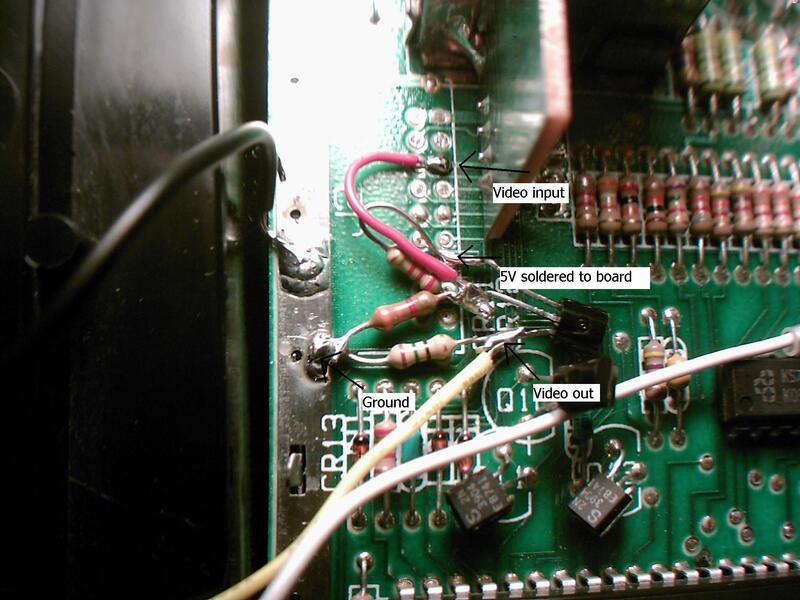 I removed a pair of resistors and cut the video modulator pins to disable all the Rf circuits and installed a simple color amp from the composite video connection off the expansion connector. 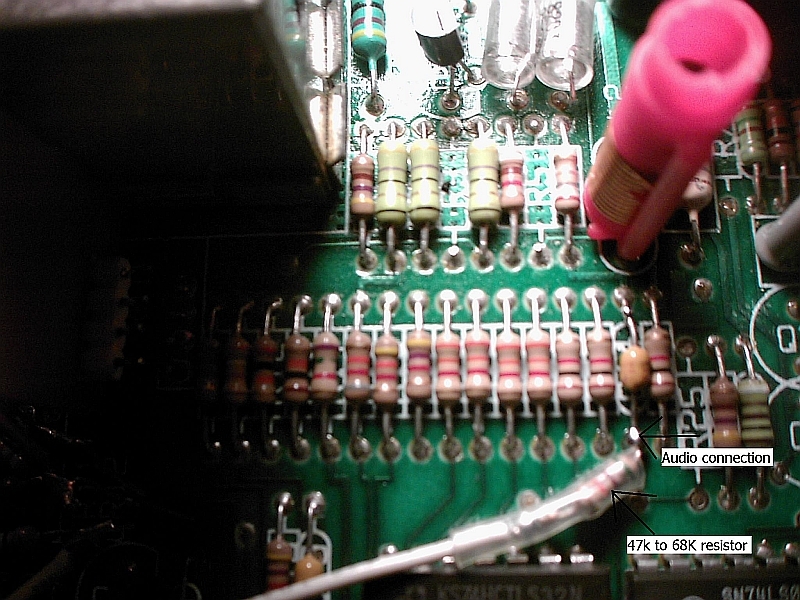 I also picked up audio from a cap off the board but had to add a resistor to reduce the volume a bit. The video out is amazing and the audio is crystal clear! I think it looks better than a couple of 2600s I modded for composite video. This procedure uses less parts than any other 7800 mod that I have seen. 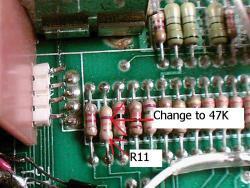 By removing the RF circuits I was able to use the exsisting Luma resister ladder instead of having to recreate it. 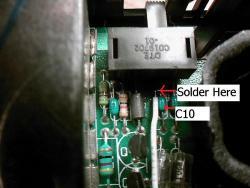 The total parts consisted of 4 resistors and a transistor. Has anyone done this before? I can go into more detail if anyone is interested. I realize some will want to keep the RF output intact but if you don't, this works great. I would love to get more details on this. Keeping RF is not neccessary for me. I just did the same except I did not cut the video to the RF modulator. The colors look great. I had to adjust the monitor to reduce the brightness. I was going to just make an external cable until I had to desolder things off the board. I drew a schematic of my amplifying circuit here. I disconnected the audio from the video in order clear up the diagonal lines. Where it is disconnected I added a cap to amplify the audio. Where did you get the audio signal? Yep, you did. I didn't see your post till this morning. Nice work. I have used that video amp many times! I removed R3 and R5. Cutting the lines to the RF modulator are not really necessary but why have it hooked up if it is not being used. This insures a clean signal. I picked up audio at the bottom of C14. I was suprised how loud the audio was. I put a 47K resistor between the audio out and C14. 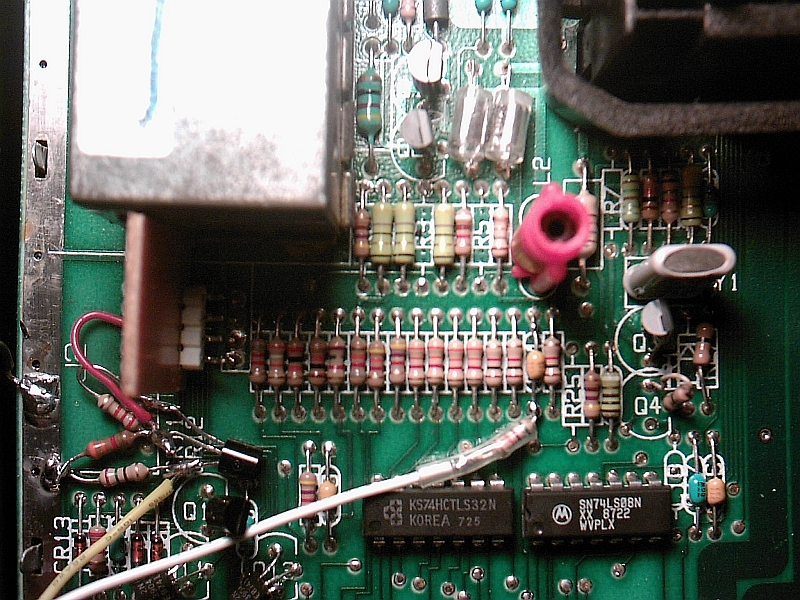 I soldered the amp together directly on the 7800 board. I will post a Pic. I just closed the case up last night and forgot to take a picture. I left the RF connected because I still have TVs with only coax or antenna connections. I might have to use the 7800 on them. I think I disconnected R6 and R5 from the video and join the loose ends together then amplified the signal to get my audio. I think I needed to do that to get the Audio to work for both 7800 and 2600 games. I did most of this work 2 weeks ago but just got the RCA connectors to close the case properly last night. Edited by Almost Rice, Thu Jun 26, 2008 9:04 AM. I just closed the case up last night and did not take a picture. I left the RF connected because I still have TVs with only coax or antenna connections. I might have to use the 7800 on them. Leaving the RF Connected is not a bad thing for people who might use it. A switch can easily be installed to swich between Composite and RF to keep the interference out of the composite video when needed. BTW, I picked up video the same place as you, off the expansion connector but it can be picked up off pin 3 of the video modulator connection too. 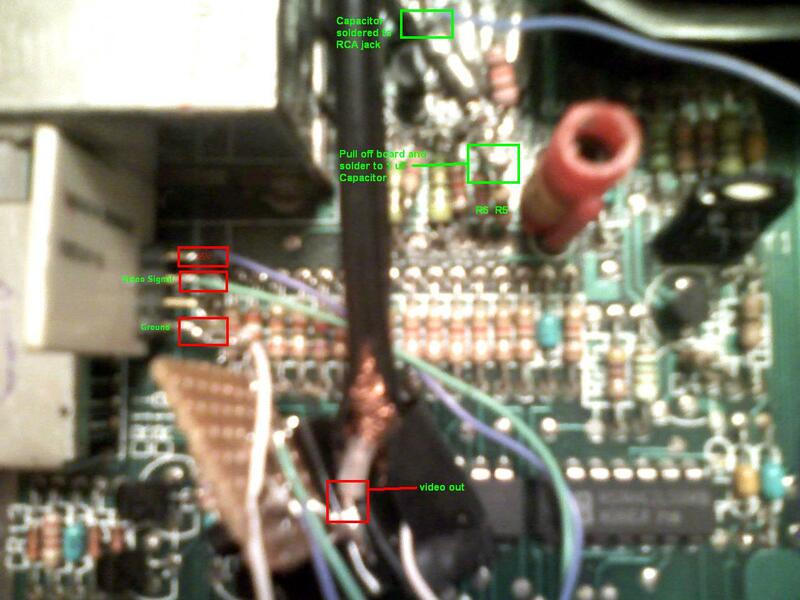 Once I decided to make it internal, I moved it to pin 3 of the video modulator connection and I was also getting power and ground at the RF modulator connection. The circuit is nice and small(fits on a 1cm x 1cm perf board). Can you guys post some pics of this, especially the soldering points - and components used. I've wanted to video mod my 7800 for a couple of years now, but the 8-Bit domain one is way overpriced and the horror stories of ordering from him didn't encourage me. Sure, I will take some pics tonight and post them with a parts list and description. I think anyone with decent soldering skill should be able to do this mod with little trouble. 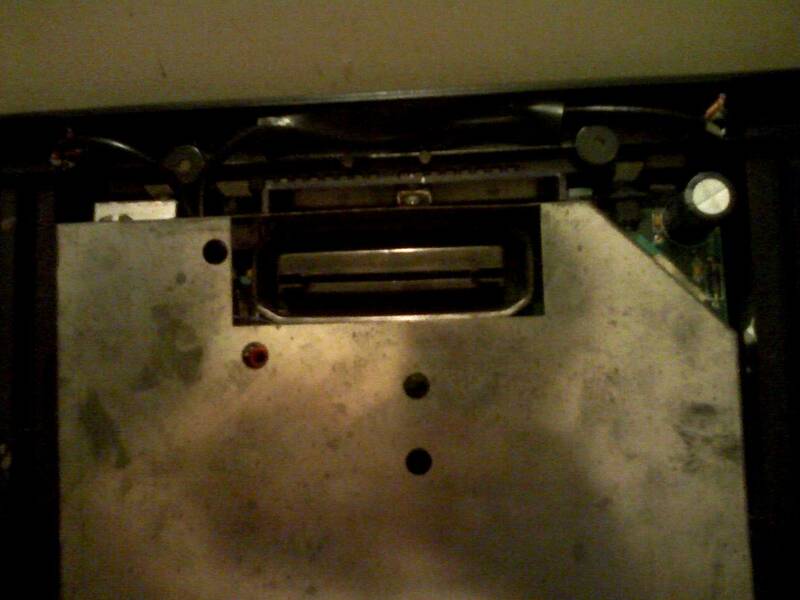 Could you point out where the expansion slot is at, so I can pull the audio/video from there? I don't own a 7800 anymore, so I have no way to poke at it and see. Edited by keilbaca, Thu Jun 26, 2008 9:58 AM. I have been wanting it too that is why it motivated me to do this. I did not want to wait for 8bitdomain either. I will open her up and take some pics tonight. I did not design it to be pretty so don't be too harsh. 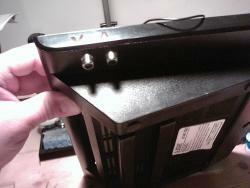 I did not pull the audio from the expansion port direct to RCA so I went inside the case. Pulling R5 and R6 for audio also cleans up the video signal. I guess I will have to clean things up for the pic. I was going to make it an expansion port cable only because I didnt want to do anything permanent on my 7800. I still have the cable I made to connect to the port so I will take a pic of that, too. Edited by Almost Rice, Thu Jun 26, 2008 10:11 AM. If you are looking at your 7800 board the expansion slot is on the left. Some later 7800 boards don't have the expansion slot and some have a spot for it but no physical connector. I didn't pull the audio from the expansion port either, just the video. There is audio on the expansion port but is is heavily muted through a resister and is barelly audible when connected to a monitor. C14 or the juction of R5/R6 and adding a cap like Almost Rice did is the better way to go. I think this will all be clearer when we post some pictures. I don't care about "pretty" at all, especially if it's all concealed under the case. I just want to be sure I have the right solder points and components to put this together. I'm off work next week and the wife is out of town, So I have liberty to mess up the house with electronics work & tuning my HDTV, and have plenty of time to clean up. 1. Open up the 7800 and remove the metal shield. 2. Locate R3 and R5 and remove them. 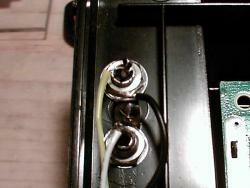 this is a good time to drill two holes and install the RCA Jacks. I installed mine facing down on the edge of the case. 3. 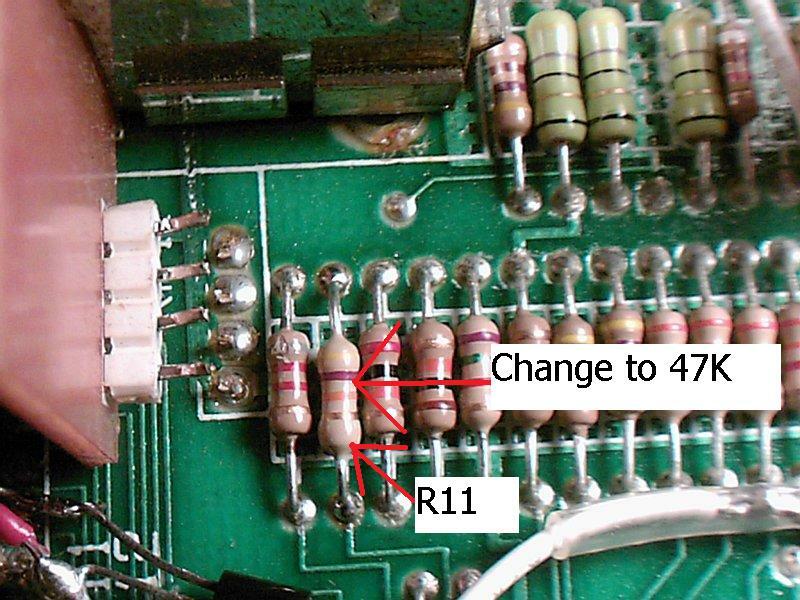 Locate R11 and replace it with a 47K resistor. This is optional but it cuts down the brightness a bit. I didn't have this problem on my magnavox monitor but on my TV some light collored characters were over-driven. 5. Build the circuit in the schematic. I just soldered the parts together then soldered the transistor's collector to the 5V connection on the expansion bus connector. The connection is the third point from the bottom on the right side. 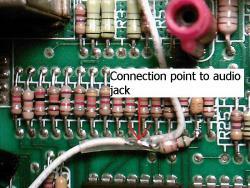 I made my ground connection by soldering the resistors to the edge of the board. I then ran a small wire to the video connection on the expansion bus connector. 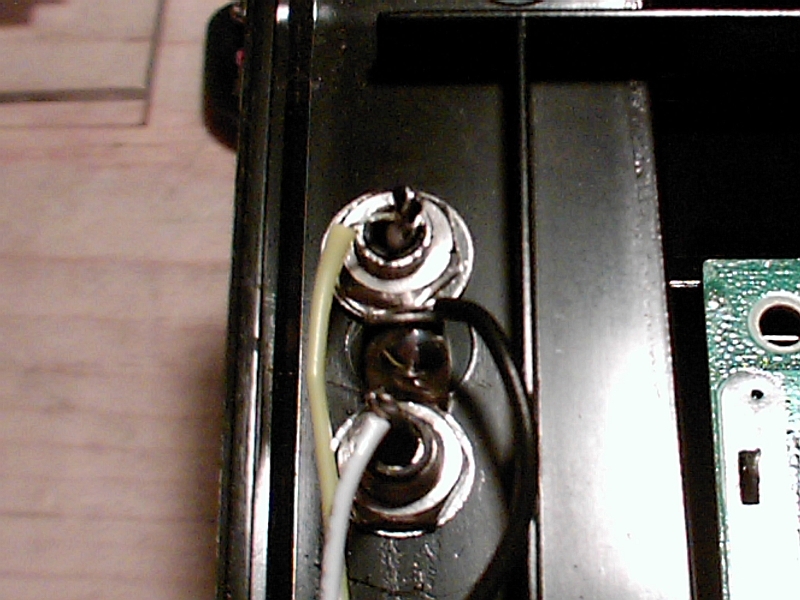 Finally I ran a yellow wire to the RCA jack. this worked well for me but it may be easier for some to build the circuit on a small piece of PC board such as Almost Rice did. 7. Run a wire from the top of C10 to the audio jack. This is the POKEY audio. I actually made the connection by running a wire from C10 to where the audio jack connects to the resistor I added for the audio output. 8. 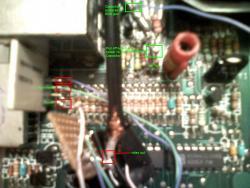 I connected the ground wires to the RCA jacks and connected the other end to the ground trace on the edge of the board. 9. 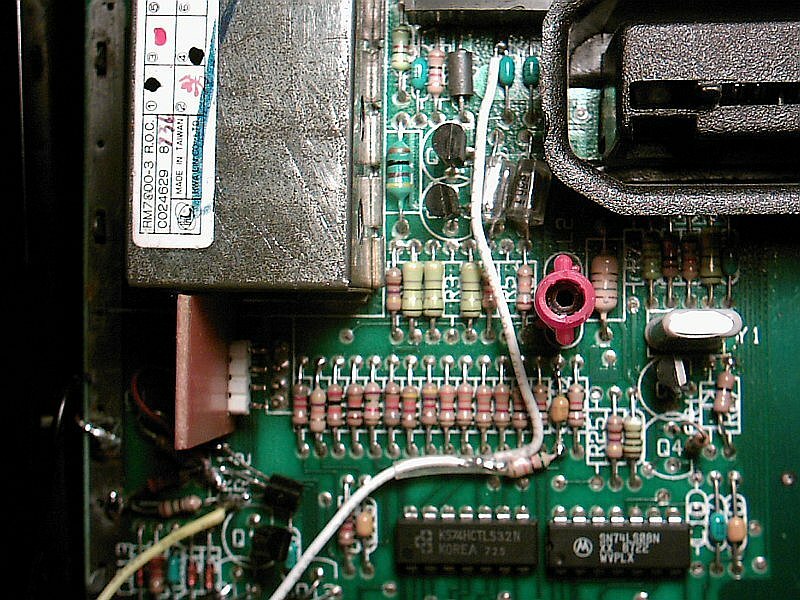 Put the 7800 back together and enjoy the clean video and audio! Edited by puppetmark, Tue Jul 8, 2008 7:03 AM. Is it possible to take audio directly from the TIA for this? I know you'd need an amp, and you also may have audio coming in through the cart port. IIRC you have monaural audio coming from the POKEY chip in the cartridge, but a few 2600 games use both channels of the TIA separately. What kind of circuit would be used to allow mono from the Pokey, but still allow stereo sound (if desired) from the TIA? 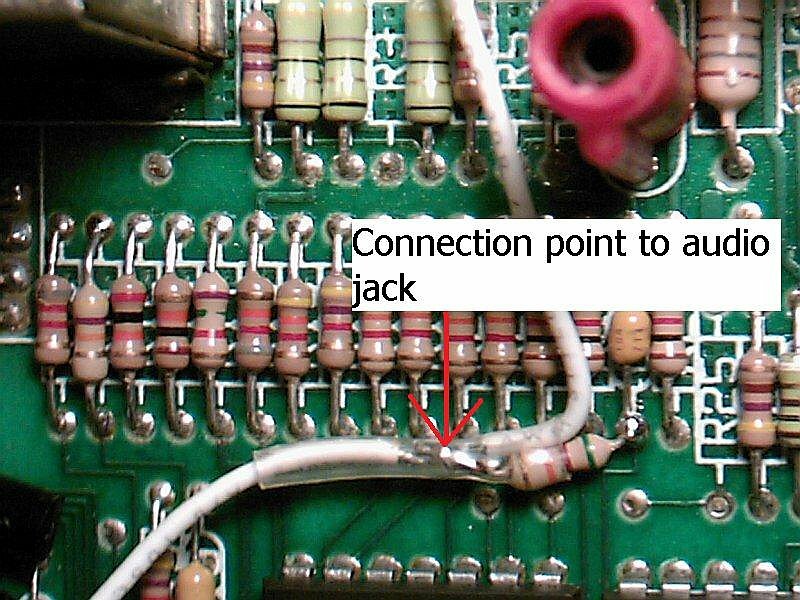 If you've usually got one signal from the TIA, then the Pokey signal could be routed along that same path to your left channel audio amp, then to the red RCA jack. A second amp would be hooked to the "right" channel on the TIA, then to the white RCA jack, and normally the inputs of those would be bridged together--possibly by a toggle switch. That would allow the player to set the unit for stereo sound during games like Air-Sea Battle, but use mono sound for anything else. Any other sources from within the 7800 could possibly share a common input to the left and right channel amps that have been added. Does that sound off base or am I on to something? Edited by shadow460, Thu Jun 26, 2008 10:35 PM. My pictures are not as clear as I hoped they were. The RCA jacks red is video black is audio. I used shielded cable inside. I noted what I did. Green box is Audio and Red box is video. The perfboard is the video circuit similar to puppetmark's, but my 7800 has an expansion port. The signals off the RF modulator were easier to access. My audio is the only different than puppetmark's changes. 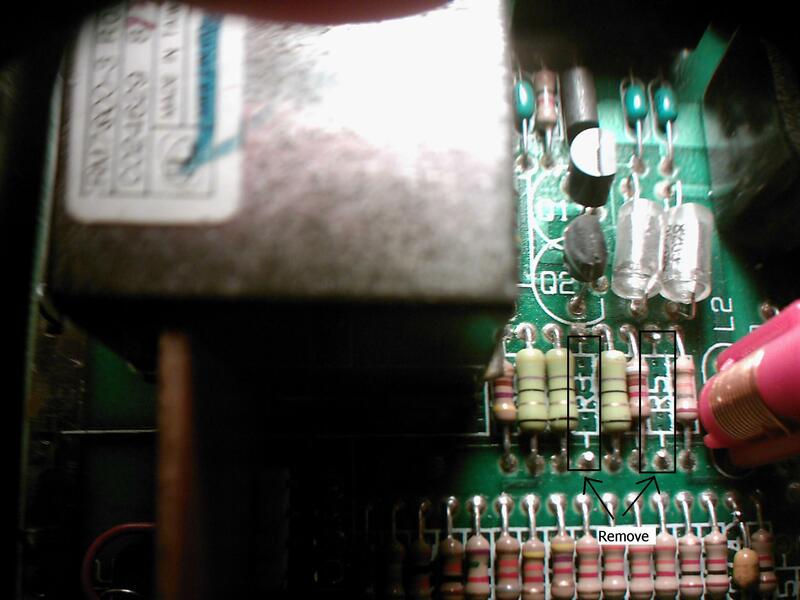 I just pulled the resistors off the board on the toward the back of the board and soldered R5 and R6 together and added a capacitor. I also pulled one end off at R3. I forgot the reason I used R5-R6 to get the sound. I believe it was to get both 7800 and 2600 games including Pokey sounds. I have tested the games out and they sound great. When I hack my other 7800s, I will try puppetmark's changes. Also, if my other 7800 has no expansion port, I will try to build a Svideo output from the port signals. Edited by Almost Rice, Fri Jun 27, 2008 9:25 AM. Nice Work. I think pulling the video and 5V off of the modulator may be easier than what I did. I had trouble getting close with my cheap camera too. What I figured out was that I can use my magnifying lamp on my workbench and put it between the 7800 and my camera and it acts like a Macro lens. Thanx, yours looks very compact. I had to use 3 parallel resistors to make a 68 Ohms resistor in place of the 75. I wanted to pull the signals off of the expansion pins 1-3, but the connector was in the way. The picture looked good on the camera, but I should have checked when I was at home. I was wondering why your pictures were so clear. I used my camera phone without a macro feature. Next time I will make it much cleaner. I was experimenting and left my work on the board and I did not want to do anything too permanent. The shielded cable was hard to handle. I will probably find a thinner cable next time. Edited by Almost Rice, Fri Jun 27, 2008 9:45 AM. D'oh, how dumb am I... I could have just pulled the video and audio signal before it hits the RF converter. its not like a 2600 where its built in. 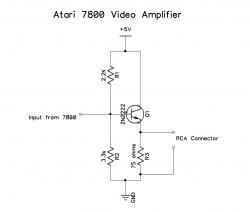 Well, if you don't mind a dark signal, you don't even need a video amp, it'll be just like my easy atari 2600 mods. Is it just as dark as a non powered audio/video mod for the 2600? Edited by keilbaca, Fri Jun 27, 2008 10:01 AM. I thought about it. The signal was barely enough to get a signal on my TV and the image rolled. The amplified signal is a bit too bright, but I can adjust the monitor. The signal was barely enough to get a signal on my TV and the image rolled. The amplified signal is a bit too bright, but I can adjust the monitor. I had the same experience. 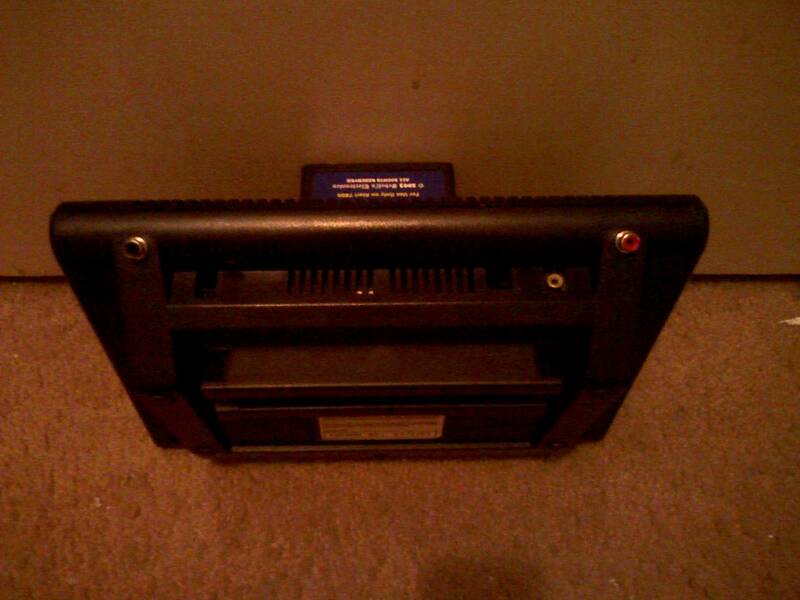 Without the Amp, it was unusable. If you change out R15 with a larger value, perhaps a 91K, it should decrease the brightness. This is purely speculation. I am fine with turning down the brighness a bit. This is fantastic guys! thanks for all the pics. I'm going to do this next week. I might even try the 91k r15 replacement just to see what I get. What about my system? It's the PAL (rev 3?) board with no expansion port. I'd like to just pull composite video at least off the modulator or something. The RF female port on mine is just about cactus and all I get is a picture resembling trying to tune into a TV station that's 50 miles away. Well, by comparing the schematics the same thing looks possible on a PAL system. Remove R1 instead of R3 and R5 looks to be the same. You should be able to pickup the audio out at the bottom of C17 instead of C14. The video amp should work fine. You should be able to pick up the video at Pin 3 of the RF modulator. Looks like 5V can come from Pin 2 and GND from Pin 1. If the modulator is not functioning , I would cut the pins from it. 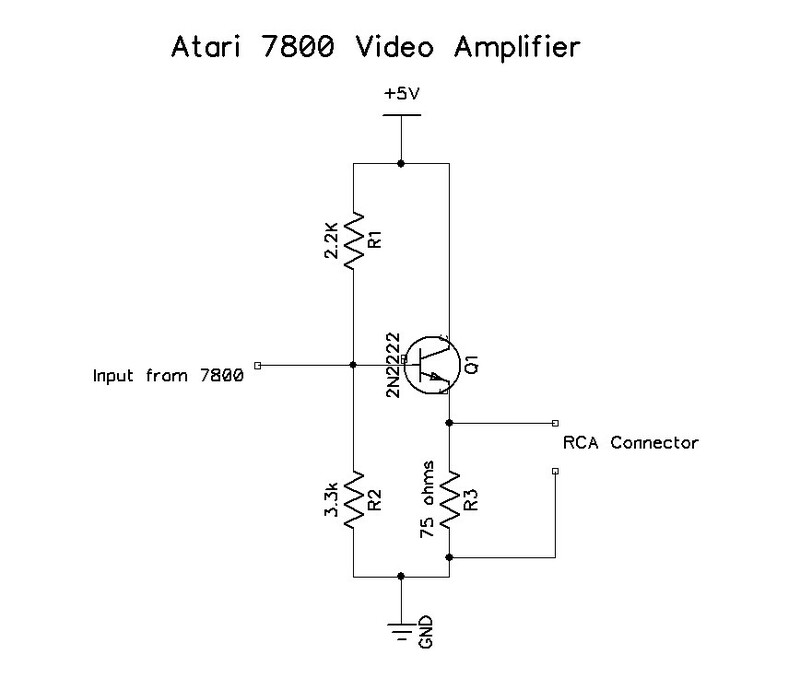 I don't have a PAL 7800, so I don't know where the components are located, but if the schematics on atariage match your 7800, I think it will work.